Lynda & Chan's flower girl adorn a cute mint silk flower crown with a pony tail and a cute tutu mint dress, and the finishing touch: silver ballet flats and a round white silk flower ball with a milk organza string for easy holding! The ring bearer was so stylish in his light grey suit, traditional brown shoes and matching mint bow tie! Lynda and Chan's ceremony was held at The Cathedral of the Christ the Light in Oakland, California. 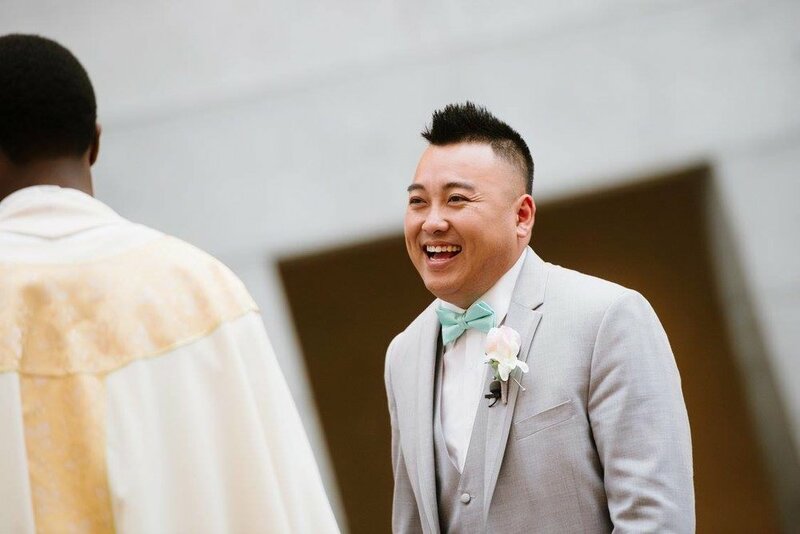 Tall ceilings, curved bench seating and plenty of natural light made this a great ceremony venue for those who would like to get married in a church in Oakland, CA! Lynda adorned a Haley Paige ballgown with a detachable lace neckline, supporting a finger tip length veil while holding a silk bouquet made by Songs from the Garden LLC. 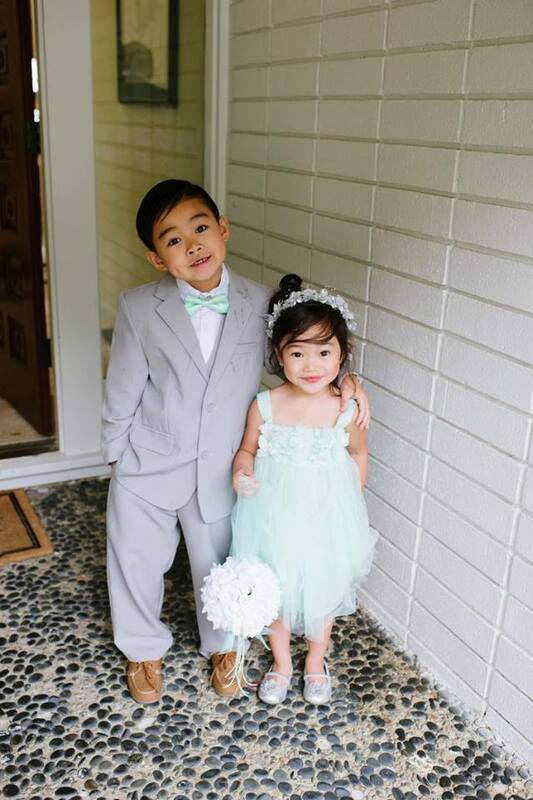 Chan is the groom version of the ring bearer in his stylish light grey suit, his silk flower boutineer and his matching mint bow tie. DIY invitations by the bride by adding a mint & grey string was so adorable! Traditional chopsticks placed inside silver beaded napkin holders atop an interesting folded mint napkin provided by Ginger Cafe catering. And a beautifully designed cake from La Patisserie with silver laser cut cake topper from Etsy. We are so grateful to have such fun and loving clients! 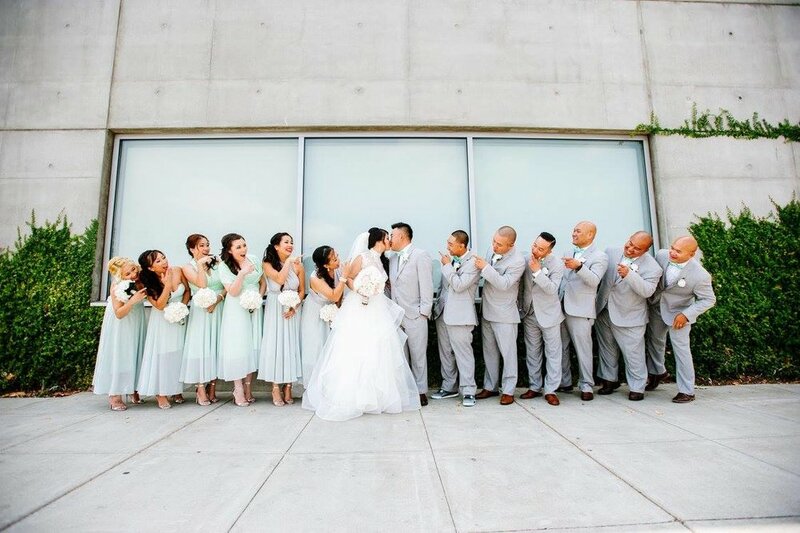 Lynda and Chan laughed all the way through their wedding day and we wouldn't have it any other way! 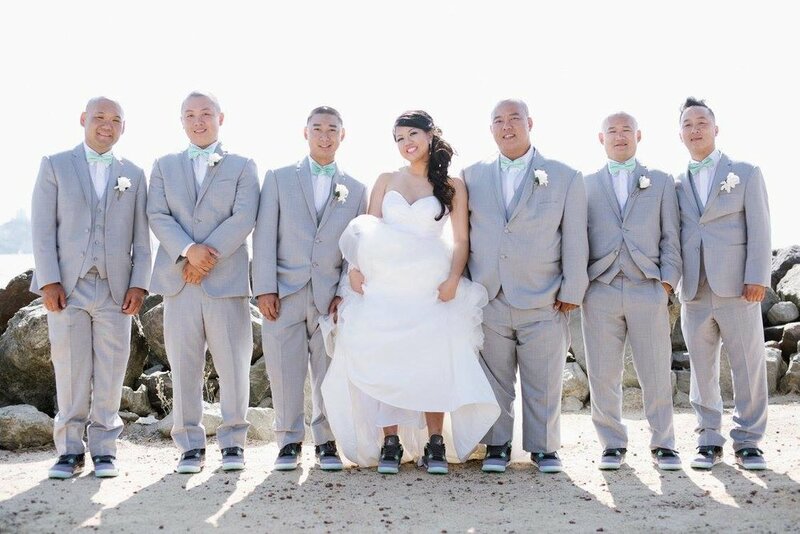 Lynda even wore custom-made black and mint sneakers matching the groomsmen! Now if that's not laid back and fun we don't know what is! We would like to thank Lynda and Chan for trusting us with their big day!